Step 2. ﻿Range hood types - pick one! 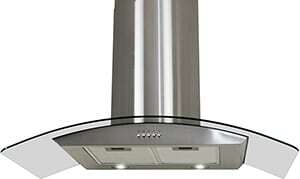 The second step in this range hood buying guide will involve further narrowing down the kind of range hood you want. It's very important to do this in a structured manner, because range hoods come in all kinds of shapes, forms and price categories, so it's very easy to get overwhelmed. Since we don’t know your personal situation, we have summed up the different range hood types below. 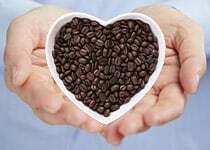 Choose the one which mostly suits your situation. available. These range hoods are attached to the underside of the kitchen cabinet above the stove top. 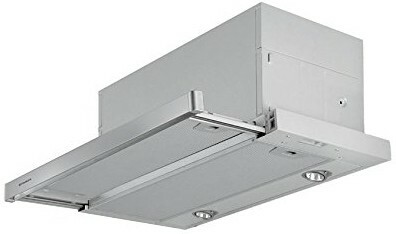 They come in both ducted and non-ducted models, both of which will generally outperform retractable range hoods (see third one in this list). The trade-off is that they take up more space than retractable ones. Installation type: Both ducted and ductless. up as much as possible, these range hoods are used as an addition to the design of the kitchen. They look great, but that's also the downside of chimney range hoods: they are relatively expensive. You pay for great design. power off when you slide them back in. Since they're usually integrated into the cabinet above the cooking stove, they will save you even more space. However, all this space saving comes with a price. 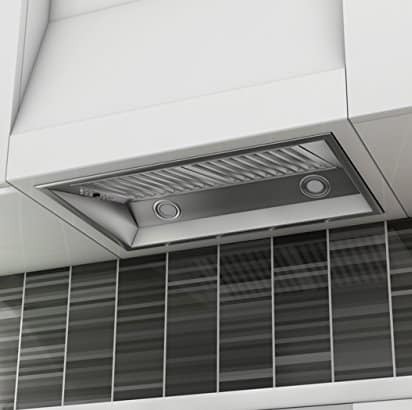 To most effectively capture all the air contaminants which result from cooking, the bottom part of the range hood needs to be at least at wide as your stove (more on that later). 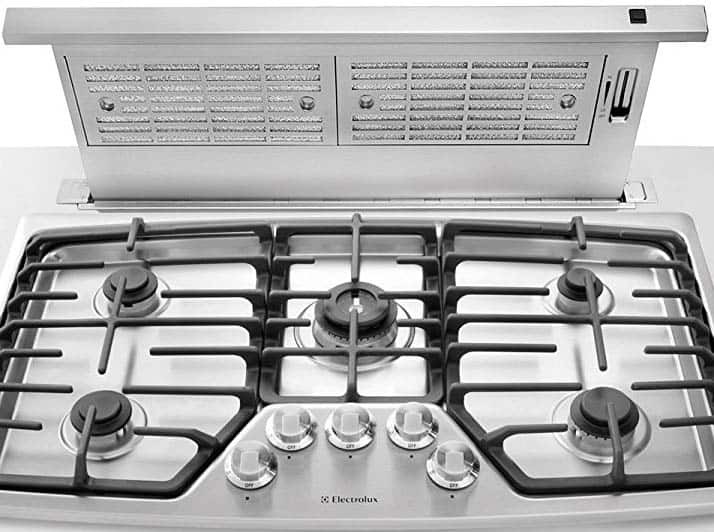 However, even when fully retracted, retractable range hoods generally won't cover the whole stove. 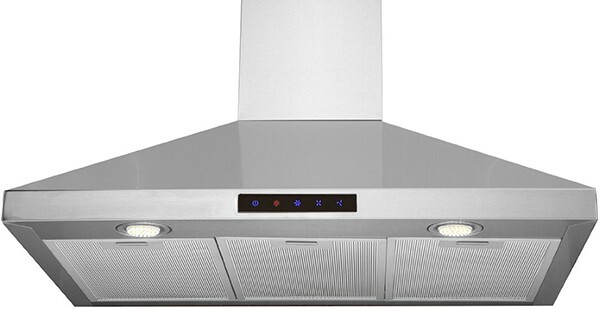 On top of that, they also tend to have smaller filters compared to non-retractable range hoods. That means that they might not be able to fully capture of the odors, oils and fumes (especially retractable ductless range hoods). retractable parts, or any other parts sticking out for that matter. However, like with retractable range hoods, saving space means there's a trade-off. The size of the cabinet above the cooking surface is usually smaller than the size of the cooking surface under it. That means that the range hood won't cover the whole surface of the cooking surface, and therefore only captures a limited part of the odors, oils and fumes. downdraft system as a built-in feature, integrated into the cooking surface itself. However, if you don't want to buy a new cooking stove or if you want to buy a stove separate from your ventilation system, don’t worry. You can also buy a them as a separate unit and install them in or on top of your counter. To save some extra space, some of them can even be raised from and lowered into the counter. The obvious nice thing about having a downdraft ventilation system is that you won’t have a big clunky range hood hanging in your kitchen. Especially on cooking islands seem these downdraft ventilation systems seem to give off a stylish and modern vibe. However, their position also has some downsides. Normal range hoods are installed above your cooking stove for a good reason: heat, steam and smoke naturally go upwards. Since downdraft ventilation systems are placed to the side of your cooking stove, they have to have a lot of extra sucking power to be effective. Downdraft ventilation systems generally do a good-enough job with smaller pots and pans which are located right next to it. 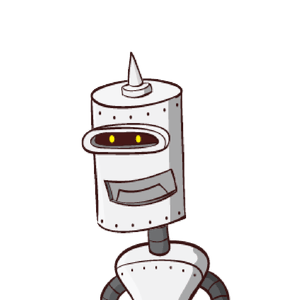 However, when you're using tall pots and pans or locate them a bit away from the fan, these systems seem to struggle with capturing the air pollutants. Another issue is that downdraft ventilation systems seem to get overwhelmed more easily. Since the the bottom side of a normal range hood matches the size of your cooking stove, it has a big capture area for the rising fumes. Downdraft ventilation systems have no capture area, which means they it can get overwhelmed easily if there are a lot of fumes. This means that normal ducted range hoods will generally outperform downdraft ventilation systems with the same amount of power. 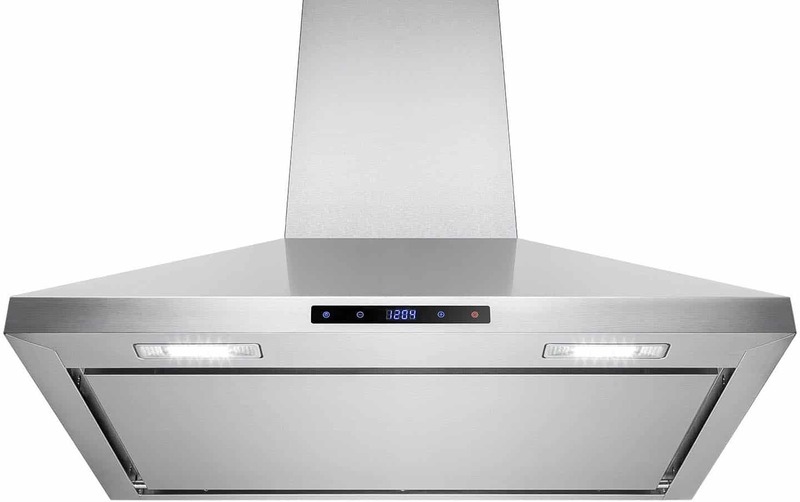 Question 3: Choose a type of range hood and put a check mark next to your preferred range hood on the PDF. Now that you have a specific type of range hood in mind, let's dive down into the specifics of your future range hood. The most important important feature by being it's power. We have to warn you though, there is some math involved. But, don't worry, we promise it's going to be really easy.